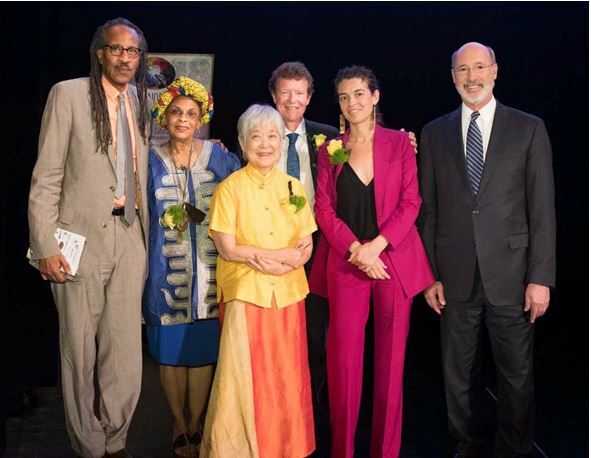 The Governor's Office honored five recipients under the following categories: Quiara Alegría Hudes, Philadelphia native – Distinguished Arts Award: Pulitzer Prize- and Tony Award-winning playwright, revered for her richly imaginative and intellectually rigorous work. Hudes’ plays and musicals include Water by the Spoonful and In theHeights. Mira Nakashima, New Hope – Lifetime Achievement in the Arts: Renowned furniture designer known for her unparalleled knowledge and mastery of wood; director and custodian of the GeorgeNakashima Woodworker studio and property. Tina Williams Brewer, Pittsburgh – Artist of the Year Award: Internationally renowned fiber artist known for her artistic exploration of African history and culture. Brewer uses symbolism and textiles to create story quilts that reflect issues of family, women and children, and spirituality of the culture. C.F. Martin & Co., Inc., Nazareth – Special Recognition for Advancing the Arts: Six-generation, family-owned, and world-renowned guitar maker with a 185-year history of crafting handmade instruments using innovative techniques. Martin guitars and Martin strings have been played by countless musicians, including Elvis Presley, Paul McCartney, and Eric Clapton. Scribe Video Center, Philadelphia – Arts Leadership & Service Award: National leader with a 35-year history of community-based film, video, audio, and new media programs. Founded by MacArthur “Genius Award” winner Louis Massiah, Scribe is particularly known for exploring, developing, and advancing electronic media to advance social change. About The Governor’s Awards for the Arts The Governor’s Awards for the Arts celebrate the excellence of the arts in Pennsylvania. Since 1980, the awards have recognized not only individual artistic achievement, but also the contributions of outstanding artists, individuals, organizations, and businesses that have helped to make the commonwealth a leader in the cultural life of the nation. Recipients are selected from nominations reviewed and recommended by an advisory panel. The awards are administered for the Governor by the Pennsylvania Council on the Arts, a state agency. About Martin Guitars and StringsC.F. Martin & Co.® has been inspiring musicians worldwide for 185 years with their superior guitar and string products. Martin guitars and strings remain the choice for musicians around the world for their unrivaled quality, craftsmanship, and tone. Throughout the company’s long history, Martin products can be seen and heard across all genres of music and in all segments of pop culture, from concert and theater stages to television and movies. With an unwavering commitment to environmental sustainability and responsible manufacturing practices, Martin continually drives the acoustic guitar market forward, introducing innovative features that have become standards across the industry. These groundbreaking innovations include the introduction of X-bracing, the 14-fret guitar, and the “Dreadnought” size guitar. Martin has also led innovations in strings, such as introducing the first high-tensile strength steel-string core wire, the first nickel acoustic strings (Martin Retro), and the proprietary Titanium Core strings. Connect with Martin Guitars and Martin Strings on Facebook, Twitter, Instagram, Tumblr, and YouTube and via www.martinguitar.com.